OPEN/CLOSE/STOP allows complete control of the door. May be used with all LiftMaster industrial operators. OPEN/CLOSE/STOP buttons and ON/OFF key control with maintained key positions, key removable in either position. Allows complete control of door with the additional feature that the OPEN and CLOSE buttons can be locked out of operation with the key control. May be used with all LiftMaster industrial operators. OPEN/CLOSE should only be used with operators wired for constant pressure to open and close (all LiftMaster industrial operators with type D1 control wiring). WARNING: When used on most industrial operators, this control will not stop the door. Use another control that has a STOP button in conjunction with this control. START may be used as OPEN with all LiftMaster operators. May be used as OPEN and CLOSE on all operators with type 132 control wiring. WARNING; This control will not stop the door. Use another control that has a STOP button in conjunction with this control. Mortise cylinder can be re-keyed or replaced to match existing lock. Black housing with stainless steel faceplate. Black, powdercoated, weather resistant finish. G559 Gooseneck post for pad mount. 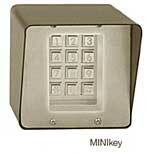 MINIkey grained stainless steel, surface mount. 500 capacity. MINIkey grained stainless steel flush mount. 500 capacity. 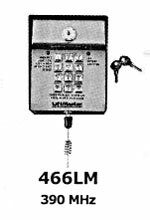 Remote keypad for MINIkey system. Grained stainless steel, lighted housing.